Part two on the soil temperature monitoring project. Detailing some thoughts on how to get the sensors in to the ground in a way that will keep them protected from the underground environment. 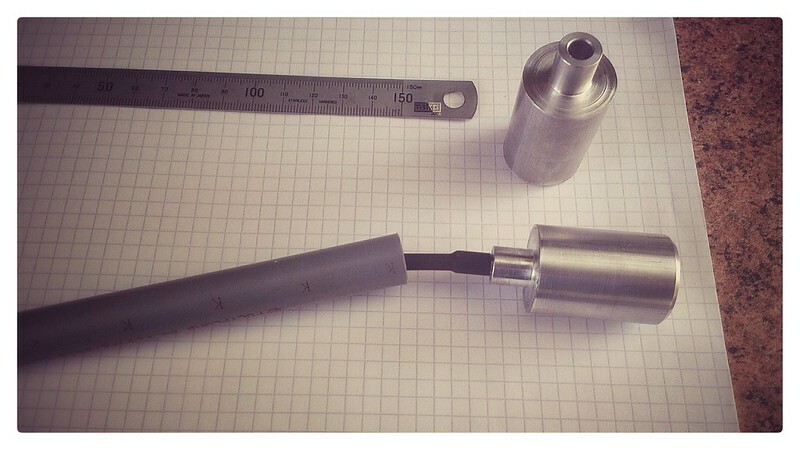 Following that, some subequent details on the construction of the sensor housings. It is time to turn to thinking about packaging the sensors into a probe housing so that they can be buried at their required depths in the soil. Ideally I do not just want to plant the sensors straight into the soil; I require a something that is much more robust and weatherproof. The solution needs to be in place for several years, and be largely maintenance free. I would not want to have to be digging the sensors up every few weeks to sort out problems. After some research on the net, I was inspired by a product, the Delta-T PR2, designed by a UK company (page here if you are interested) which is basically a lance with aluminium spacers set at intervals down the probe shaft. My own design is a very simplified version of the PR2, but with just one sensor per probe making the design and manufacture easier. 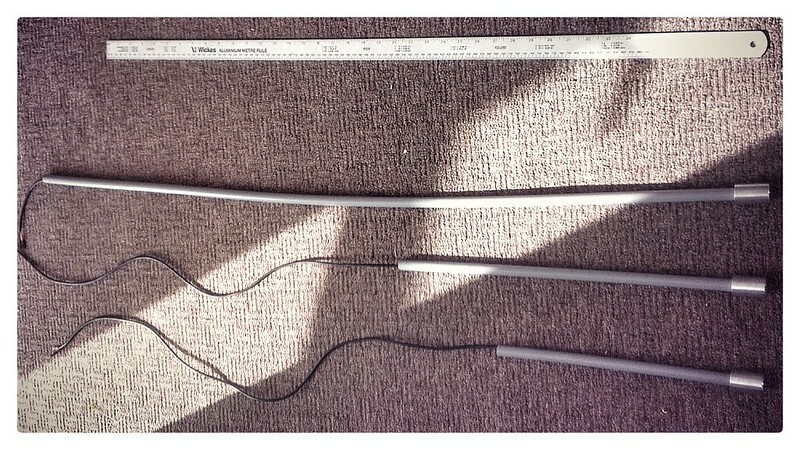 I decided to make the probe shaft from some 10mm polypropylene central heating pipe as it comes in handy 2m lengths, is cheap and is easy to work with. I liked the idea of the probe having an aluminium casing acting as a large heatsink with the sensor inside so I got hold of some 20mm stock aluminium and turned some probe heads on a lathe. Above, you can see how the sensor fits inside the probe head and how in turn the probe head fits into the probe shaft. Both sensor and shaft are interference fits - there's no need to complicate the build further than that. Prior to installation I will coat the sensors with a layer of lithium grease to prevent the stainless steel of the sensors and aluminium of the probe heads bonding over time in a damp environment. I decided to use 4 core telephone cable as a an option for hooking up the sensors, basically because I had a large reel of it hanging around the workshop. 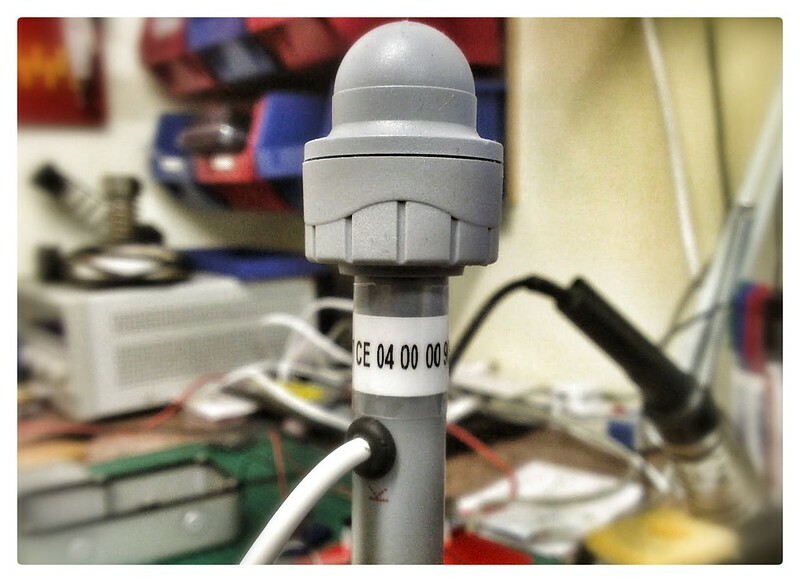 The cable is connected to the sensor cable inside the probe shaft and then exits via a grommet, to provide a small amount of water resistance, at the above ground end of the shaft. The final step to completing the probe packaging is to discover the address of each sensor and have that printed on the part of the probe shaft which will be above ground once installed. This will obviously make it easier to identify which one is which later. Above ground end of probe package complete with a hat on the top! For details on how I identified each sensor take a look here.